C57BL/6 male mice (8 weeks, Harlan) were pretreated with by intravenous injections with PERY or SCR peptides (15 mg/kg) or DMSO. The following day, mice were treated with 1.5% dextran sodium sulfate (DSS) in drinking water for 7 days followed by 3 days of normal drinking water. During DSS administration, mice were treated every other day (total of five intravenous injections). Control groups included nontreated mice (no DSS, no treatment) and mice receiving PERY peptide with normal drinking water (PERY only, no DSS). Mice were then euthanized and analyzed. Colitis was evaluated using (C) hematoxylin and eosin (H&E) histological sections of the colons (top) and their magnifications (bottom). Scale bar, 2 mm. Lympho-myeloid potential assessed by FACS analysis of human CD19 (B-lymphoid cells) and CD33/CD15 (myeloid cells) in bone marrow of NSG recipient mice, 17 weeks after transplantation. Each plot represents an animal from the experiment presented in panel. C, Jurkat cells with SB202190 at 1, 5, and 10 μM were tested, and a decreased SRP72 expression was found when using at 10 μM (lanes 8 and 9). D, results were analyzed and RUA illustrated, finding significant results at 10 μM at 240 versus 0 and 120 versus 0 min (p<0.05). CD34 expression after 14 days of culture of CB CB CD34+ cells treated with the P38α inhibitor Ly2228820 or vehicle (DMSO; n=3). Error bars represent SEM. Human perforated disk cells were pretreated with speciﬁc pathway inhibitors, BAY11-7082 (NF-jF inhibitor) and PH797804 (p38 inhibitor), atdifferent concentrations (1, 10 ng/ml) for 1 h and then incubated with IL-1b for 48 h. (B) VEGFAexpression was quantiﬁed and analyzed; (C) Ang-1 expression; (D) TSP-1 expression; (E) ChM-1 expression. Expression levels were uniformly set to a valueof 1 in PBS group. Data are presented as mean±SEM (n = 3) and analyzed by one-way ANOVA test. *P < 0.05 as compared with IL-1b-induced group. TLR4/MAPK pathway regulated macrophage polarization towards M1 phenotype. LPS/INF-γ induced macrophages were cultured in the absence or presence of siTLR4, SP600125(an inhibitor of JNK), SCH772984(an inhibitor of ERK) and Skepinone-L(an inhibitor of p38) respectively for 24h. Then, all the cells were harvested for western blot assay. Losmapimod 是口服有效的选择性p38 MAPK抑制剂，其作用于p38α和p38β的pKi分别为8.1 和 7.6 。 Phase 3. 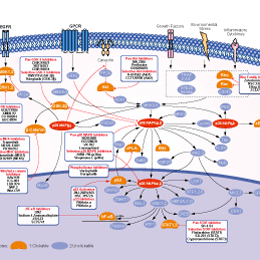 Intracellular pathways of b-adrenoceptor-induced proliferation. Urothelial proliferation (% of basal responses) in T24 in the absence and presence of (d) losmapimod (1-30 μM).